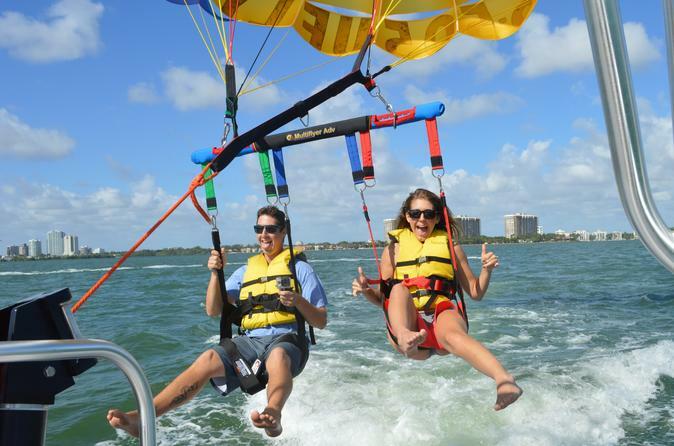 Go parasailing off the coast of Miami for an exhilarating experience in this tropical paradise! As you float high above the waters of Biscayne Bay, get incredible views over Coconut Grove and the Miami skyline. Soar through the air in the company of two friends; they can help you be on the lookout for dolphins and turtles swimming below! All instruction and safety gear is provided, no experience necessary. Meet your guide at the shop for parasailing instruction and a safety briefing. Get outfitted in the provided gear, and then board your motorboat to head out on the sparkling waters of Biscayne Bay where your parasailing adventure begins! Your guide helps you into the parasailing equipment, making sure that you are safely strapped in and ready to fly. Gently soar into the air to soak up stunning aerial views of the Atlantic Ocean and Miami skyline. Get an amazing perspective on Key Biscayne, Stiltsville, Coconut Grove, Coral Gables, downtown Miami, Miami Beach, Fisher Island and more. You can even spot turtles and dolphins frolicking in the water below you! Not interested in making a splash? You won’t touch the water unless you request it from your guide. And you don't need to be a swimmer to partake in this safe and thrilling adventure. Even kids ages seven and older can participate when accompanied by an adult. Friends that want to go on the boat ride to take photos and watch as you glide through the air can join for an additional fee. After a scenic flight, your guide carefully brings you and your parachute back on to the boat. Savor the thrill of your flight. After your parasailing experience, return to the marina where your tour started/ ends. Please note: Observers are able to join and watch for an additional $35 per person; no parasailing allowed.